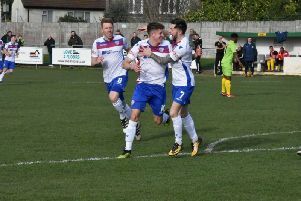 Alex Collard is happy for AFC Rushden & Diamonds to be seen as one of the underdogs in the battle for the play-off places in the Evo-Stik League South Premier Division Central. Andy Peaks’ team remain firmly in the hunt for a top-five finish after they claimed an impressive 1-0 victory over fourth-placed King’s Lynn Town at Hayden Road last weekend. Two more home matches now lie ahead for Diamonds as they take on Leiston on Saturday before hosting third-placed Stratford Town on Tuesday night. Diamonds have slipped under the radar somewhat having come up from Step 4 last season. But an impressive run of form since the middle of November has seen them lose just once in the last 14 league matches while their current unbeaten run was extended to five matches after last Saturday’s success. Collard, who joined the club at the end of November having left Kempston Rovers, was at the heart of a superb defensive display as they limited a strong King’s Lynn side to few chances in front of goal. And the centre-half admitted it was the sort of game he enjoys. “I don’t think many have backed us to reached the play-offs, which is good from our point of view,” Collard said. “We are just trying to grind out results and I think we have only lost once since November or December time. “It was a good win against King’s Lynn because they had been flying. “It was a good result in tough conditions and sometimes you have to win ugly and that’s what we did. “It’s always good to clean sheet, the boys dug in really well. We made sure there were no gaps and they didn’t cause us too many problems. Collard was thrown straight in at the deep end following his arrival at Hayden Road as injuries to club captain Liam Dolman and Jack Ashton had left Peaks short of options at the back. But, despite both players now being back to full fitness, Collard’s displays have seen him keep his place at the heart of the defence. However, he insists he is taking “nothing for granted”. “When I first signed I was fortunate that there were a couple of injuries so it was a case of needs must for me to go straight into the team,” he added. “I am pleased I have managed to stay in there. The manager has trusted me and I feel like I have been doing alright. “I have just got to keep working hard and taking nothing for granted."